I thought feudalism was dead? I know two of the men pictured above and have nothing but respect for them as legal scholars. They have even been invited to the launch of my new book, The Poor had No Lawyers. But I do question the relevance of the offices they hold as Her Majesty’s Officers of Arms (legally members of the Royal Household) and known as the Albany Herald, Rothesay Herald and Ross Herald, Carrick Pursuivant, Unicorn Pursuivant and Ormond Pursuivant. A recent tale of woe from an ambitious and dynamic amateur football club, Formartine United (disputed crest below) demonstrates the archaic nature of this institution and its rules. Why should not anyone be able to design a badge, crest or shield if they want without getting the (expensive) permission of these curious Royal Officers? And what is all this nonsense about family conventions? 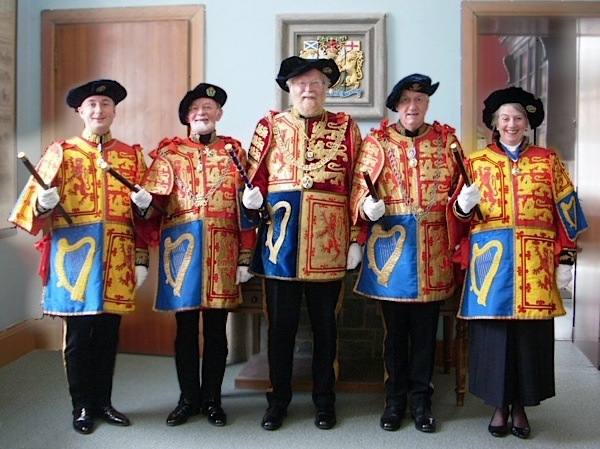 In a time of public spending cuts, should we not simply abolish the Court of the Lord Lyon? Feudalism has nothing to do with it. This is all about trademarks. 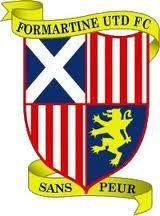 Formartine United can’t call themselves Manchester United nor can they pinch other people’s logos and symbols. As for cost-cutting, the registration of clansmen’s arms is a profitable business. A grant of armorials should not be confused with a logo or trademark which is often styled to look heraldic. The Court of the Lord Lyon is a service to the nation and is also concerned with matters of State which we in Scotland are proud of. The Court is ‘under new management’ at a time of technological change, and if it is not profitable I would argue that any amount involved is trivial. I would advise against tearing historical structures down; better to assist them in some positive way. The loss to Scotland would be much regretted. Your comments show a serious lack of knowledge about the workings of the court and the nature of the offense. The Lyon Court is a court within the Scottish court system, the same as a family law court, and is charged with hearing specific cases concerning specific breaches of the law. In this instance it is the Act of 1672 (and others) which regulate the use of heraldic devices (like the one depicted above) in Scotland. The offense concerns the football club having defrauded the government out of the statutory fees it collects when permission is granted to use a heraldic device in Scotland. The levying of the statutory fee is no different than the fees collected when applying for a building permit, and the legal requirement to pay the fee is just that– a legal requirement whether one is a football club, a multi-national corporation, or a private individual. The offense was brought to the notice of the Procurator Fiscal who was then obliged to instigate proceedings in exactly the same manner any other criminal proceedings would be dealt with. The case was passed to the Court of the Lord Lyon (which is the court of competent jurisdiction in such cases) and in all likelihood will be disposed of without need of trial. As you are undoubtedly unaware the national symbols of all member states of the EU are now protected under copyright law administered from Madrid. This copyright protection includes national flags, thus the use of the white saltire on a blue field– the national flag of Scotland– is in breach of EU copyright when used as a logo type without government permission. In Scotland the authority that grants that permission is the Court of the Lord Lyon. Perhaps, before having launched your attack on the Scottish Court system, you should have asked one of those legal scholars you claim to respect to explain to you what it is they actually do, and exactly how the court functions.